Yard signs at Affordable Signs make a great drive-by impression. 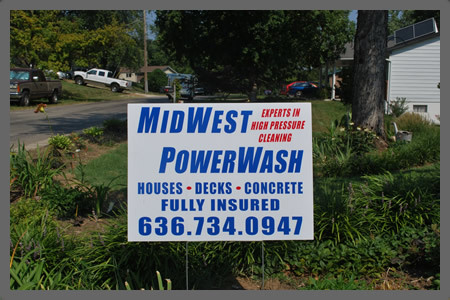 Yard signs increase the impact your business or message has on anyone that sees your signage. Yard signs are great for business use, to announce a sale, identify the business name, or even direct customers around the property. Your yard signs will appeal to passing traffic, entice potential shoppers and encourage phone calls. When placed in a visible location and designed to attract attention, yard signs can and will drive traffic into your store. Yard signs can also be used as an announcement for a special occasion or event, such as an anniversary, graduation, or grand opening. It's easy and fun to send a personal message by customizing yard signs for your special event. Yard signs have long been an industry standard for real estate agents and political campaigns as well, and Affordable Signs offers inexpensive yard sign solutions for every agent or candidate. Now is the time to start creating unique, personalized lawn signs. Lawn signs are easy to design when you know a few tricks. Here are some secret tips for maximizing your curbside marketing results with yard lawn signs. 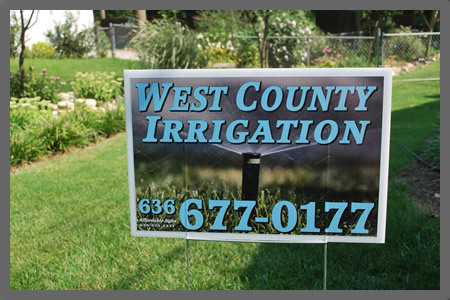 When designing custom lawn signs, use contrasting colors and large fonts. Your lawn signs only have four to seven seconds to attract the attention of viewers, so get to the point! A dark background with dark text makes your yard lawn signs nearly impossible to read. For the best impact, design custom lawn signs with a dark background and light, vibrant text and images, or vice versa, to create appealing and readable lawn signs. Also, use no more than five, big words on any and all lawn signs. For standard-sized, 18x24 lawn signs, your text should be at least 3 inches tall so that passing traffic can easily read your message. This standard rule will keep your text large and your lawn signs un-cluttered. The more you try and squeeze into your yard lawn signs, the less-likely people will see it. Custom yard signs from Affordable Signs are available in a variety of sizes, the most-popular, or standard sizes being 12x24, 18x24, 24x36 and 24x48. Affordable Signs can produce custom yard signs in any size, however, so you're not limited to the popular sizes for custom lawn signs. If you are ordering custom yard signs on a budget, corrugated plastic is your best material choice. Custom yard signs printed on corrugated plastic are affordable, lightweight, and easy to install using wire stakes. For real estate listings, business identification, and other more-permanent signage, aluminum or Max Metal are great choices for your custom yard signs. Aluminum is weatherproof and easy to bolt into a real estate frame, which protects your custom yard signs from damage and keeps them sturdy. Use Max Metal for larger custom yard signs, as the material is lighter than aluminum but much thicker and virtually indestructible. As you can see, Affordable Signs offers a wide variety of custom yard signs. Yard signs are one of the most-visible and affordable methods of advertising. 8 out of 10 home sellers in the United States use lawn signs. Custom yard signs are an essential tool that political campaigns use to increase name recognition for their respective candidates.